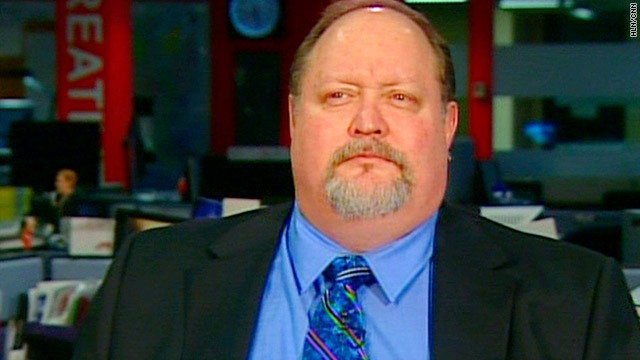 Nate Phelps, son of anti-gay Pastor Fred Phelps, told HLN Wednesday he thinks what his dad does is evil. Nate Phelps says the actions of his father, the anti-gay Kansas pastor, are "evil"
(CNN) -- An estranged son of anti-gay Kansas pastor Fred Phelps said Wednesday that the spiritual leader of Westboro Baptist Church hit his wife and beat his children with a mattock handle until they bled. "But at the same time you can't ignore the fact that he's done a lot of damage," Phelps said. "He's hurt a lot of families, not only in the gay community, but the families of these soldiers." The younger Phelps said his father also hurt his own family. "He used his fists. He used his knees and he used ... the handle of a mattock," said Phelps, referring to a pick-like digging tool. "He used that in such a way that it split the skin on the back of the kid's legs so they bled." "If they want to call that discipline, that's fine. But I call it abuse," Phelps said. The son said Fred Phelps also hit his mother, but not with the handle of the mattock. Phelps has also said his father abused prescription drugs when he was in law school. He didn't back down from the claim during the HLN interview. Velez-Mitchell read a statement from Nate Phelps' sister, Shirley Phelps-Roper, denying the claim. "Yikes. Hell no. His (Nate Phelps') imagination goes on and on," Roper wrote. "This lie should not have come out of his mouth when he decided to reject the word of God. Nothing he can say will change the fact that God hates (homosexuals) and their enablers and therefore God hates America and America is doomed." Nate Phelps responded that his sister "just cynically lies about what happened." Likewise, Phelps said his father manipulates facts and circumstances to reach false conclusions. "My father can make any connection to anything that anyone has done or hasn't done in their life and point to that to say that that's evidence they're damned and going to hell," Phelps said. "He's convinced that homosexuality is the ultimate sin against God. "So since the United States is taking steps to move in the direction of equality for gays in America, he says that has doomed America," Phelps said. "So anyone who is connected to America, so anyone who is supporting America in any sense is subject to the wrath of God." When asked what he would say to his father if he could, Nate Phelps replied, "I've never had a relationship with my father. I wouldn't know what to say to him." There was no immediate public response from Fred Phelps to his son's televised remarks.